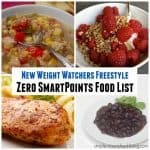 Home » Weight Watchers Recipes » How Do You Keep Track of Your Meal Plan Ideas? 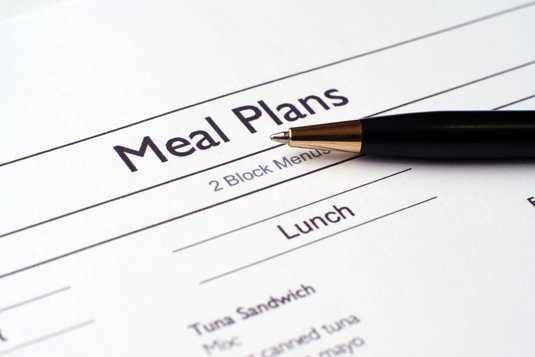 How Do You Keep Track of Your Meal Plan Ideas? Q: I am having difficulty with meal planning. I can find meals I want to cook and then I make a grocery list. I come home and put all the food away. Then I forget what I planned. I cannot find a proper way to write this down so I can use it. It sounds silly and yet it should not be so difficult. What am I doing wrong? It’s a great question, right? You peer into the fridge and see a package of chicken or ground beef, a package of shredded cabbage and couple of zucchini and you have no idea what you intended to do with them. Or you saw a recipe for a great soup and bought the ingredients, but know you don’t remember where you saw the recipe. How do you keep track of the recipes you are planning to make with the groceries you bring home? 1. 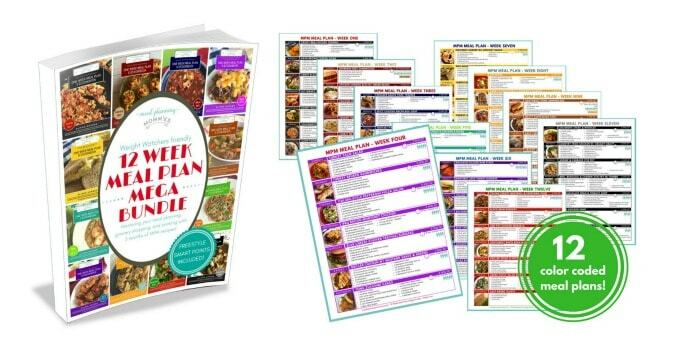 Print off the recipes and leave them in a file folder in your kitchen. 2. 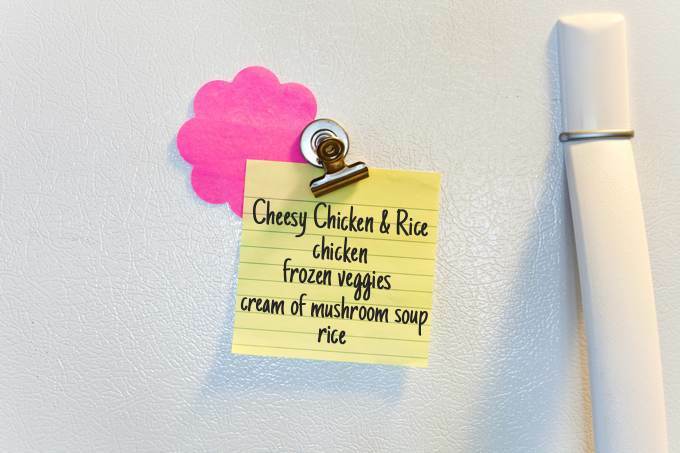 Make a list of the recipes and where they are located and place it on your fridge. This is what I do. On a large yellow post-it note I jot down recipes I plan to make with what I’ve purchased. Do you have any other suggestions for keeping track of the recipes/dishes you are planning to make with the groceries you bring home? #2) Martha – we have been meal planning like this for a year now. It helps with groceries, and also meal prep on the day. I need to remember what to pull out of the freezer, or to prep the night before. 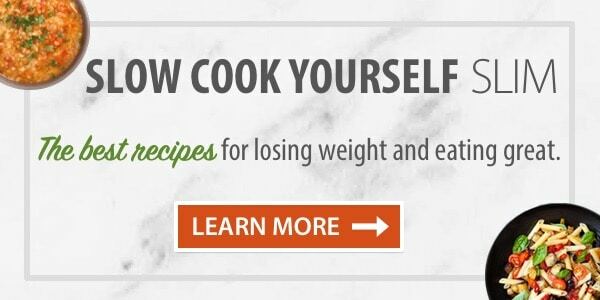 Most of the meals that I find online – such as Slender Kitchen – or in cookbooks, I put on the notes section. I also place the recipes on Pinterest that I have interest in – and then move them to CopyMeThat when I have made them. 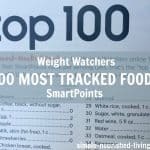 Your site, since I found it a month or so ago, has become invaluable in both my planning and cooking, as I am on Weight Watchers. 15 pounds down, and counting! Thank you! 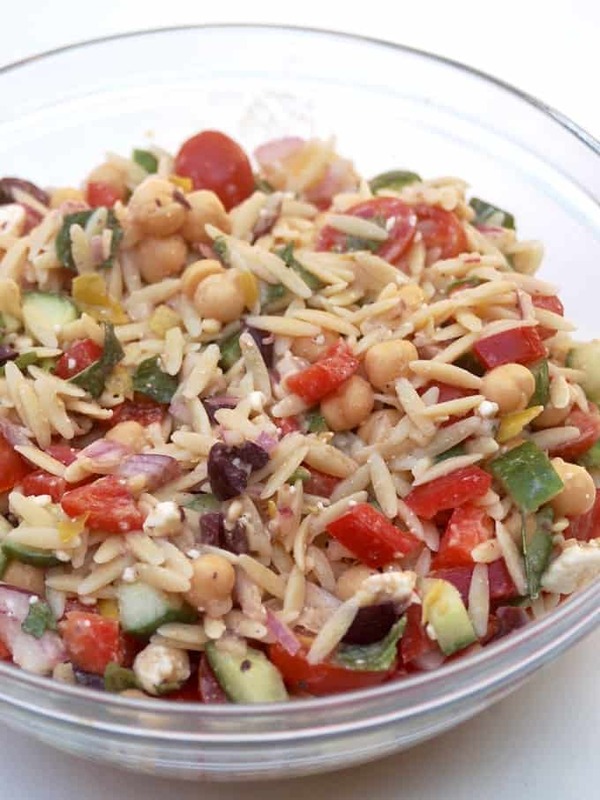 – Karen C.
#4) I use a lot of Pinterest recipes and was having the same problem finding the recipes when I was needing them, I created a folder “this week’s meals” and saved the recipes into there. Once I was done with it I could delete it out. #5) I put my menu on one half of my paper, by grocer list on the other. I use different colored pens for each unique meal. So Monday’s spaghetti might be red. Tuesday’s tacos green etc. I use the same color pen when adding items to my grocery list. I add check marks if an item is used for multiple meals. Black for the general items. The colors make it a little more fun. #6) Hi there. I have a couple things I do – I sometimes select a cookbook for the week. I select several meals and put tabs on the pages with the day I plan to make it — and make my shopping list as I go. When it’s time to cook, I just find the tab for that day. Other times I use various Websites and take a screen shot of the recipe on my iPad. Again, make a shopping list as you plan. A simple list of the recipes and a notation that it’s on the iPad is all that’s needed — your sticky note on the fridge would work for this. Hope this helps someone! 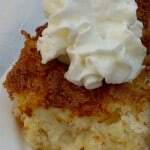 – Jan R.
#7) I have a couple binders of loose recipes as well as cookbooks. If I am making a binder recipe, I remove it. I then plan my menu for the week and use a monthly calendar, jotting what I will make for the day and if it’s a cookbook recipe, name and page number. I then compile my shopping list. This has worked extremely well for me and I don’t waste food anymore. #11) Martha, first, thank you for all your wonderful recipes. They are really helping me on my journey! As to Meal Planning – Paprika!! (Recipe/Meal Planning App). I upload, or create, all the recipes I love. Each week I’ll choose 6 recipes, usually after choosing my protein from the Freezer as we stock up when there are sales. Using Paprika, I find a recipe and use the option to select items I need to purchase. I then have my grocery list at my fingertips at the store as well as the list of recipes I’ve chosen for the week. Also, use of a daily planner w/ space for meals works – again, the post it notes are a help when flexibility is needed for schedule conflicts. If possible, I’ll list the main meals on my shopping list, so as not to forget what extra veggie/sides are needed for each meal – salsa, additional items often served w a specific meal. #24) Pinterest! 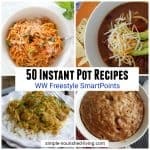 I save all the recipes I’m planning to cook from online sources in Pinterest. #25) I use the Notes app on my iPhone to jot down my planned recipes and their location (pretty much same as you, but digital). That way, I always have them with me. (Most of my recipes are also digital, so I can find those fairly easily too) I also keep a “template” list of the type of recipes that work for me, e.g., Easy–baked fish w/broccoli and mushrooms; Soup–pasta fagioli (SNL); New–mushroom stroganoff (Pinterest). My grocery list goes underneath my meal plan in the same note. #27) I bought the 12-week meal planner ecookbook (affiliate link) by Alisha Hughes from Meal Planning Mommies. It is great 12 weeks with a shopping list which is wonderful. I just make a copy of the list and go shopping for the week. – Roberta R.
#28) I keep a small notebook in my kitchen and write down what I’m cooking each day and where recipe is. I also make note if something needs thawing or extra prep. 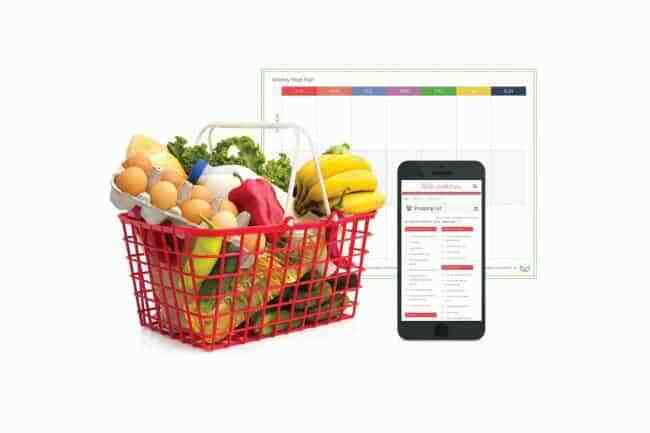 – Mary Ann C.
#31) The app AnyList keeps recipes, adds ingredients you need to a shopping list, and keeps a calendar with the meals on it! You can import recipes from almost any website…I have dozens of yours on it Each part can also be shared with as many other people as you wish, so, if someone else is going to the store, they can already have the list on their device. The app can also be your general place for all your to-do lists. 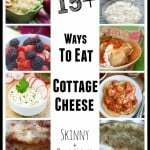 – Lynn K.
#32) I have a meal planning board on Pinterest. 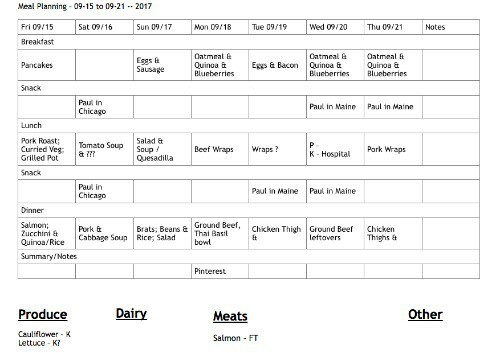 I copy 4 to 5 recipes and date the week. By keeping the recipes on the board I can reuse the meal week another time of the year. 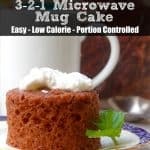 It works great for me since the recipes are there. – Rachel A. #33) I have a 3 ring binder filled with recipes I have gathered at WW meetings, on websites and from Facebook groups. They are separated into meal groups. I plan my week by browsing through the recipes and pull out the ones I plan on making. I keep these in a magnetic clip on the fridge. My shopping list includes ingredients for each of these recipes, and I have made notes and comments on each so I know exactly what is going to make me happy. – Susan W.
#35) I use a calendar (one of the many you get towards the end of the year) and put the recipe name, cookbook and page if applicable. Or I pull loose recipes and use the above to compile the grocery list. I then refer to the calendar week to keep track of what to cook when. Works great! – Barbara C.
#36) I make a 7 to 10 day list of meals and tape them to the inside of a cupboard door..along with a list of meal ideas. – Michelle B. #38) I’m a single mom of three ages 9-18 and the Director of a child care center so my brain is constantly fighting the urge to clog with all the information I need to keep track of. For meals, I take a screenshot of recipes I find on here, in Pinterest, etc. If it takes more than one screenshot to include a whole recipe (it’s never more than 3), I edit the pics placing 1,2,3 at the top. I put all my recipes in an album on my phone then use them to take my time to order groceries online (through an app) throughout the week. I pick the groceries up on Saturday and pull the recipes up on my phone (or iPad bc they’re synced). No looking for lists I jotted somewhere. It’s all buttoned up in my phone! – Lori P.
#41) Hello Martha, My suggestion is …..USE YOUR PHONE! I use the “notes” app on my phone. Every Saturday night I plan my meals and a week’s worth of LUNCHES and DINNERS in the NOTES app. Then I plan my shopping list around the meal plan and make a SHOPPING LIST in the NOTES app so everything is on my phone when I get to the grocery store. I honestly rarely need a recipe anymore because after 48 years of marriage most of our favorite meals are in my head but someone could easily add the cookbook and page next to the planned meal and refer to the phone each day to see what is on the menu. Honestly, having the ingredients and plans in my phone has been a HUGE time saver! I NEVER forget my list when I go to the stores anymore! We also eat out a lot less because I have the food and the plan in place. We usually do schedule at least one meal a week out with friends and because that is planned it is listed under my dinner section in the NOTES app. I may change my mind or get held up at work and switch what I planned for Monday and Tuesday, but the plan is still in place. We still eat that food, just on a different day. Certain foods are always on my shopping list and the quantities rarely change unless I am getting guests. Fruits, vegetables, eggs, dairy and breads are pretty much repeat purchases each week. The only variation is what is in season and what a particular recipe might require. I also love that as I run out of things like condiments or spices I just put it in my phone and it automatically is put on my next shopping list. My menu plan looks something like this……..
#42) I used to have this problem all the time. I started keeping a 1/2 inch binder on the countertop with the recipes for the week – and the ones everyone really liked that we want to make again. Soon everyone was looking in the binder everyday, so it also got rid of the endless question “what’s for dinner” the second I walk in the door. Now the kids and my husband can move recipes they liked from the “this week” section to the “make again” .. its also easy to rip out the ones that didn’t go over so well. – Kristi B. 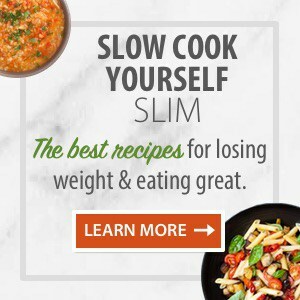 If you prefer a more sophisticated approach to meal planning with more flexibility and tons of options, you might want to check out my WW Friend Kristen from Slender Kitchen’s Meal Planning Made Easy (affiliate link), which I highly recommend! 12-week meal planner ecookbook (affiliate link) by Alisha Hughes from Meal Planning Mommies is another great option filled with easy family friendly options. Or for smaller families, you might be interested in Alisha’s Table for Two ebook (affiliate link).